A local school group boarded a plane Thursday morning to see and listen Pope Francis address the crowds in Philadelphia. 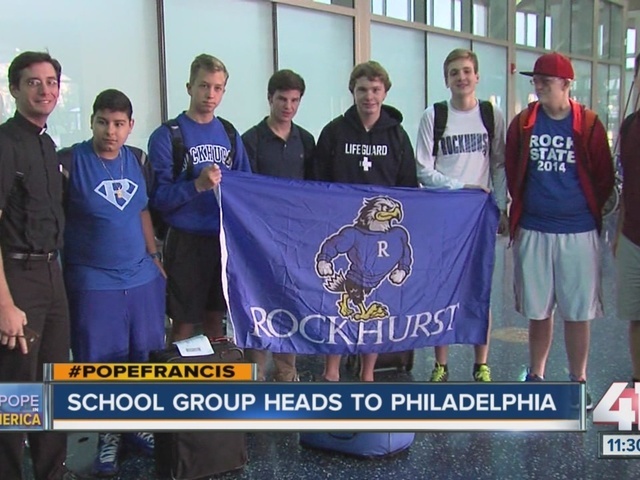 Six Rockhurst students and their chaperones flew on Southwest Flight 2850 to their destination. Two students from each grade will see Pope Francis speak in Philadelphia. The few lucky students were chosen from a raffle soon after the pontiff announced his trip to the U.S. late last year. “This is extremely spiritual for all of us, we're looking for a grace, looking to find it. It’s a historical event but at the same time we're there for the spiritual aspect,” Hans Hodes, a senior at Rockhurst High School, said. Some students in the group did bring sleeping gear since they will not be staying at a hotel in Philadelphia. Instead, a Jesuit school there will host them. Many of them said this is a spiritual journey they’re embarking on. “It's not a fun trip as many people have said, 'Oh have fun,' we're going to be praying, reflecting, communicating with other Jesuit students from around country,” Chris Bosco, an assistant principal at Rockhurst, said. Rockhurst High School is a Jesuit school and Pope Francis is the first Jesuit pope, making this trip much more special.